^ 何政廣／主編 李家祺／撰文. 世界名畫家全集 -普普藝術大師 安迪·沃荷 Andy Warhol-. 台北市: 藝術家出版社. 2002: 187. ISBN 986-7957-15-6. 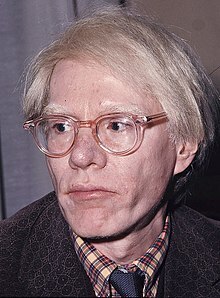 ^ Andy Warhol: Biography. 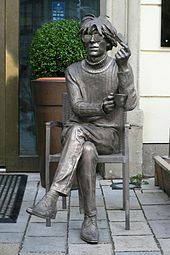 Andy Warhol Foundation for the Visual Arts. 2002. ^ Bockris, Victor. The life and death of Andy Warhol. New York City: Bantam Books. 1989: 4–5. ISBN 0-553-05708-1. OCLC 19631216. ^ The Prince of Pop Art. Arthistoryarchive.com. [2010-08-14]. （原始内容存档于2010-07-07）. ^ Angell, Callie. Andy Warhol screen tests: the films of Andy Warhol: catalogue raisonné. New York City: Harry N. Abrams, Inc. 2006: 38. ISBN 0-8109-5539-3. OCLC 61162132. ^ Livingstone, Marco. Pop art: an international perspective. New York City: Rizzoli. 1992: 32. ISBN 0-8478-1475-0. OCLC 25649248. ^ Schaffner, Ingrid. The Essential Andy Warhol. New York City: Harry N. Abrams. 1999: 79. ISBN 0-8109-5806-6. ^ Solanas, Valerie. SCUM Manifesto. London: Verso. 2004 . ISBN 1-85984-553-3. OCLC 53932627. ^ Harding, James. The Simplest Surrealist Act: Valerie Solanas and the (Re)Assertion of Avantgarde Priorities. TDR/The Drama Review. Winter 2001, 45 (4): 142–162. doi:10.1162/105420401772990388. ^ Warhol's Jackson goes on display. BBC News. 2009-08-07 [2010-03-30]. ^ Andy Warhol Biography: From The Velvet Underground To Basquiat. [2009-01-06]. （原始内容存档于2009-01-07）. ^ Boorstin, Robert O. Hospital Asserts it Gave Warhol Adequate Care. The New York Times. 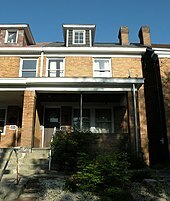 1987-04-13 [2009-01-02]. ^ Sullivan, Ronald. Care faulted in the death of warhol. The New York Times. 1991-12-05 [2010-08-14]. ^ Smith, Patrick S (1986). 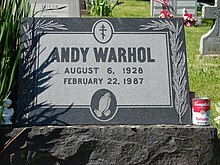 Andy Warhol's Art and Films. UMI Research Press. p.98. ISBN 978-0-8357-1733-5. ^ The Soup Cans — Andy Warhol. Warholstars.org. [2010-08-14]. （原始内容存档于2010-08-01）. ^ Bmw Art Car 1979: M1 by Andy Warhol. carbodydesign.com. （原始内容存档于2010-02-13）. ^ Andy Warhol (Getty Museum). Getty.edu. [2010-08-14]. （原始内容存档于2010年7月20日）. ^ Chiappini, Rudi (ed.) Jean-Michel Basquiat. Museo d'Arte Moderna /Skira, 2005. ^ Fretz, Eric. Jean-Michel Basquiat: A Biography. Greenwood Press, 2010. ISBN 978-0-313-38056-3. ^ 36.0 36.1 Dillenberger, Jane. The Religious Art of Andy Warhol. London: Continuum. 2001: 10–11. ISBN 0-8264-1334-X. OCLC 59540326. ^ Kennedy, Maev. Warhol: Cars. The Guardian (London). 2001-09-01 [2010-04-24]. ^ Andy Warhol Filmography. The Internet Movie Database. [2009-09-29]. ^ Staff of The Andy Warhol Museum. Andy Warhol: 365 Takes. New York City: Harry N. Abrams. 2004: 35. ISBN 0-500-23814-6. OCLC 56117613. ^ Bourdon, David. Warhol. New York City: Harry N. Abrams. 1989: 231. ISBN 0-8109-1761-0. OCLC 19389231. ^ Bourdon, David. Warhol. New York City: Harry N. Abrams. 1989: 221–225. ISBN 0-8109-1761-0. OCLC 19389231. ^ 何政廣／主編 李家祺／撰文. 世界名畫家全集 -普普藝術大師 安迪·沃荷 Andy Warhol-. 台北市: 藝術家出版社. 2002: 131. ISBN 986-7957-15-6. ^ Matarazzo, Father Sam. The Religious Art of Andy Warhol. Jane Dagget Dillenberger. New York: The Continuum Publishing Company. 1998: 33. ISBN 0-8264-1112-6. Smith, Patrick S (1986). 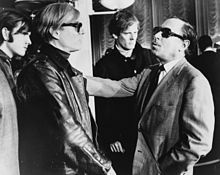 Andy Warhol's Art and Films. UMI Research Press. p.98. ISBN 978-0-8357-1733-5. "The Soup Cans – Andy Warhol". Warholstars.org. Retrieved August 14, 2010. "Andy Warhol (Getty Museum)". Getty.edu. Retrieved August 14, 2010. Colacello, Bob (1990). Holy terror: Andy Warhol close up. London: HarperCollins. p. 343. ISBN 978-0-06-016419-5. OCLC 21196706. Chiappini, Rudi (ed.) Jean-Michel Basquiat. Museo d'Arte Moderna /Skira, 2005. Fairbrother, Trevor. "Double Feature—Collaborative Paintings, Andy Warhol, Jean-Michel Basquiat," Art in America, September 1969. Fretz, Eric. Jean-Michel Basquiat: A Biography. Greenwood Press, 2010. ISBN 978-0-313-38056-3.
a b Dillenberger, Jane (2001). The Religious Art of Andy Warhol. London: Continuum. pp. 10–11. ISBN 978-0-8264-1334-5. OCLC 59540326. Kennedy, Maev (September 1, 2001). "Warhol: Cars". The Guardian (London). Retrieved April 24, 2010. Andy Warhol. New York City: Museum of Modern Art. 2007 [2009-01-23]. Berens, Stephen. Responses to Warhol Retrospective at MOCA. X-TRA (Los Angeles: Project X Foundation for Art and Criticism). Fall 2002, 5 (1) [2009-01-23]. （原始内容存档于2011-07-21）. Andy Warhol makes a digital painting of Debbie Harry at the Commodore Amiga product launch press conference in 1985.